There’s no denying that blogging is no longer a luxury but a necessity. Having a blog allows you to share specific knowledge with your stakeholders that you may not dive into on your website. Not only is a blog a great source of knowledge, it can also do wonders for your lead generation! The more content your put on your blog, the more you have to share on social media channels to drive more traffic to your advisor site! 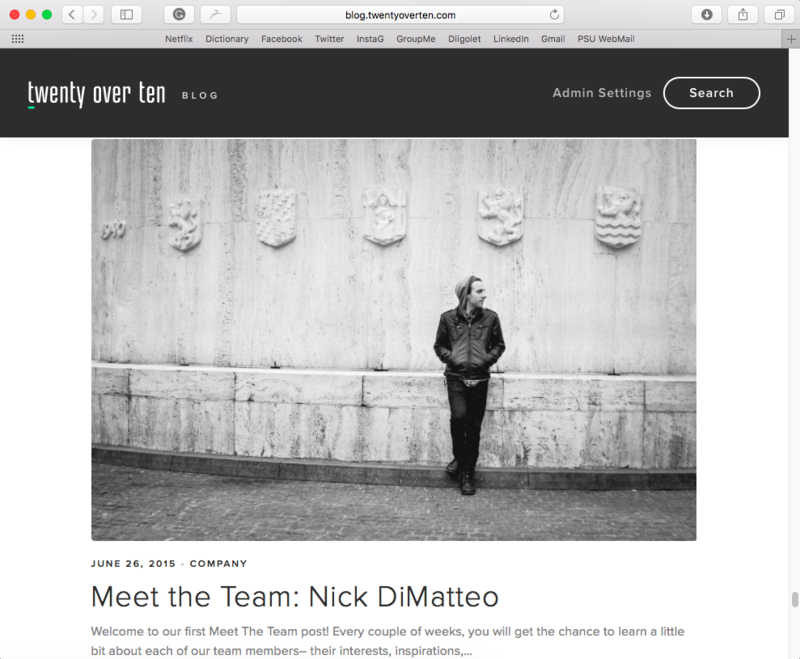 At Twenty Over Ten, we try to keep each of our blog posts around 10 minutes. 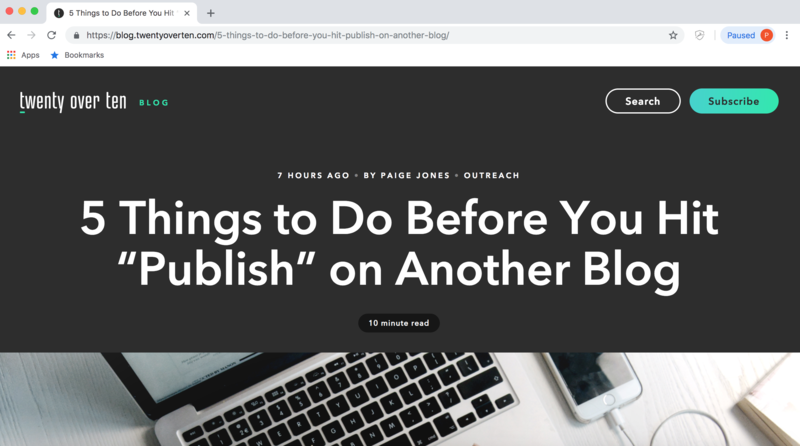 It’s a balancing act – you want to give your readers enough information for the blog to be useful, but you don’t want it to be unreasonably long. HubSpot recommends that a blog post should be a seven-minute read or average around 2100 words. You don’t have stick to these numbers precisely, but try to keep the length within a range of two to three minutes of the recommended time. It’s important to recognize that some readers might view your blog on a tablet or smartphone and can only dedicate a limited amount of time to reading. Not only should you keep your posts shorter in length, but we also recommend breaking up long text blocks with headers, bullet points, images and graphics. This will allow for bite-sized viewing and make it easier for your readers to digest information. Not to mention the amazing SEO benefits that header tags and alt tags on images can provide! Your blog gives you the opportunity to dive deeper into subjects you may not cover as extensively within your website’s content. 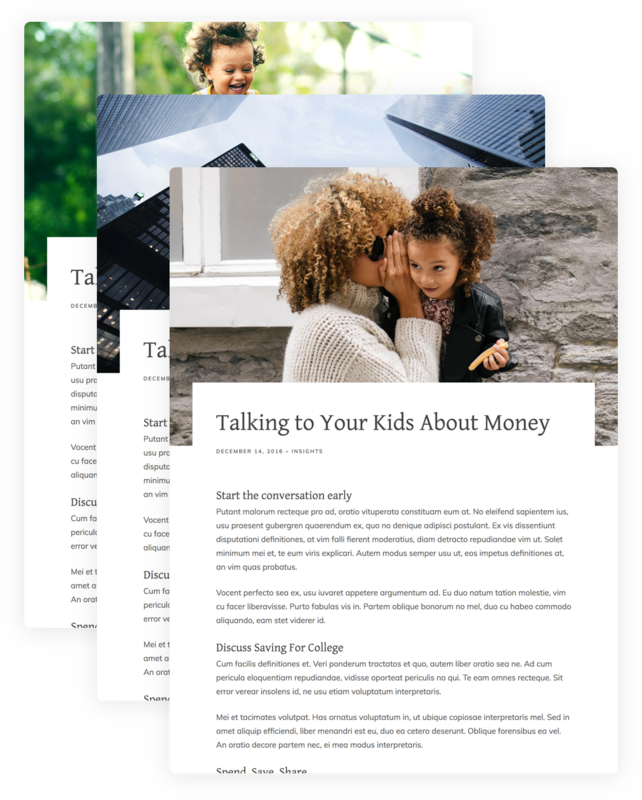 As a financial advisor, your blog should serve as a means for you to tap deeper into the niches you serve and humanize your brand by giving readers a behind the scenes look into your company. For example, if your niche is women, you should be writing about financial planning advise specifically for women. We love writing our “Meet The Team” and “Client Showcase” blogs to humanize our brand and allow potential clients to get to know us better. Be sure to take full advantage of SEO keywords within your content and carefully select phrases you want to use for inbound links to other blogs and pages on your website. The wording you choose can affect your search term ranking and can ultimately drive more traffic to your website. We recommend blogging as much as you can and with Twenty Over Ten’s unlimited blogging feature, you can do just that! A good rule of thumb for financial advisors is to blog 11+ times per month. We know that may sound like a lot but according to Hubspot, blogging as often as possible will increase the likelihood of your blog being found in search engines, shared on social media and linked to by other websites. Ultimately, this exposure will help build your credibility and it may lead new clients to your website. We know that keeping up with content across all platforms of social media plus your blog can get tricky. We recommend creating an editorial calendar to keep track of exactly what you need to post and when you need to do it. Download our free editorial calendar from this article! How Do I Get Current and Potential Clients to Read My Blog? Since your title is the first thing readers see it should be concise and intriguing. Using a statistic in a blog’s title is a popular way to build interest and demonstrate expertise. For example, instead of saying “how to boost income” instead try “how to boost monthly income by 98%” to draw in more viewers. Make sure the title gives an overview of the blog’s content and would entice a client to read! Every time you write a new blog post, get in the habit of sharing the content on your LinkedIn, Facebook and Twitter channels. And you don’t have to stop there! For additional visibility, sharing your blog content on your personal social channels isn’t a bad idea either. Try adding graphics with your social media posts to grab reader’s attention! Here at Twenty Over Ten, we use Canva to promote our blog posts every day. Check out this article on how to master promoting your blog content on social media! 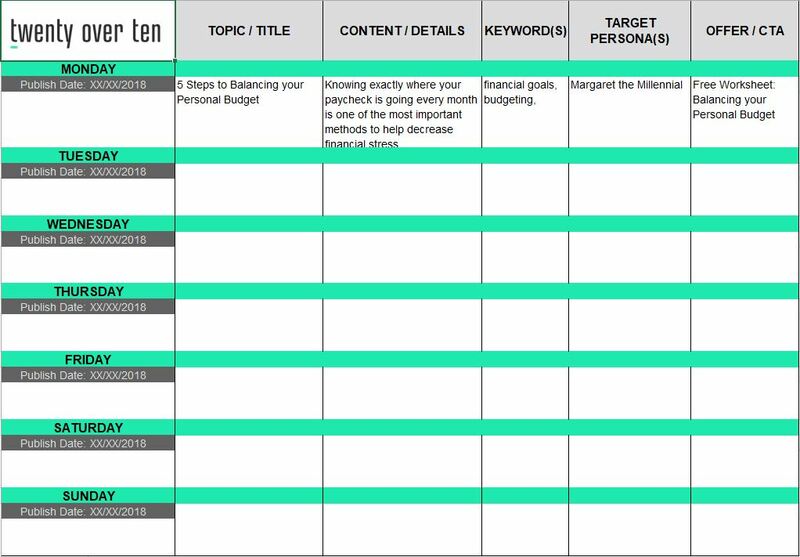 We’ve already mentioned the importance of including SEO keywords in your blog posts, but we wanted to stress SEO’s importance in steering potential clients to your posts. 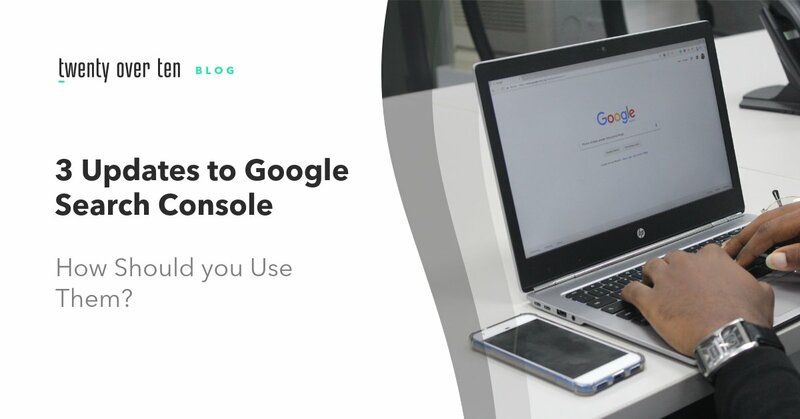 Google and other search engines reward long-form content that is informational, relevant, timely, and otherwise helps searchers find the information they’re looking for. The first and most important step to converting potential clients is simply showing up in their online search results, and that possibility can be increased through SEO! How Do I Know If My Clients Enjoy My Blog? Even if you’ve used all of the tips above, there’s no way to know if your efforts are truly working unless you perform an audit. Checking the success of your blog and website is essential to mastering content creation. We recommend using Google Analytics to check up on what’s working and what’s not. If you’ve never used analytics, don’t worry! We’ve got plenty of resources for you here. Start with the basics of Google Analytics here! Since publishing this blog, we’ve introduced a service, Content Assist. Content Assist gives our clients the direction and tools necessary to effectively run and manage the content marketing for their financial firm in one place. Since blogging and content marketing have recently gained so much importance, we wanted to make it as easy as possible for advisors to publish unique blog posts that are tailored for their firm’s voice that also speak to their unique niche. If you’re stumped with your advisor blog, we’ve got you covered. This is a service that is offered only to Twenty Over Ten clients, but it’s included in all of our packages for no additional fee! Click here to learn more! Ready to Start Creating Great Content for Your Website? Work with Twenty Over Ten’s award winning design team to build a website and start generating more business for your firm. With automatic site archiving, unlimited blogging, SSL certificates and more — we’ve got everything you need and then some. 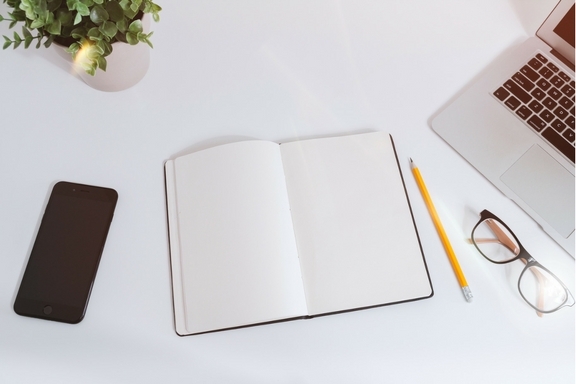 You may also like: 5 Tools to Help You Write Better Blog Posts, Blogging + Landing Pages = Lead Generation Machine, and Blogging for Financial Advisors 101.